Please scroll down to the bottom for English Version of tasting note. 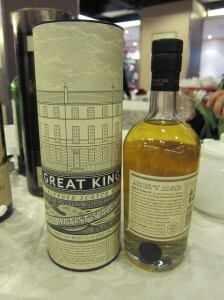 Great King Street 是一款調和威士忌 blended whisky, 是其生產的廠家 Compass Box 公司所在 New Town of Edinburgh 的街道名字. 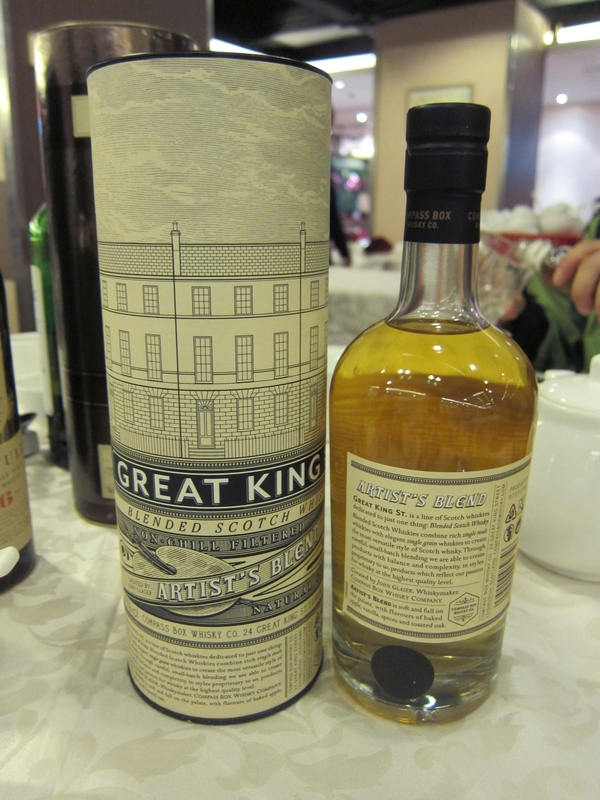 Compass Box 是由來自美帝的 John Glaser 於 2000 年創立, 他的理念是要令蘇格蘭威士忌更平易近人和連繫人們. Compass Box 的出品有別於其他同業的風格, 並不以陳年和酒廠為主打, 主要是調合麥芽, 調合穀物和調和威士忌, 以風味和格調來命名酒款, 如最輕柔的 Asyla, 調出香料風味的 Spice Tree, 重泥媒的 The Peat Monster 和穀物威士忌的 Hedonism. 有業界人士稱 John Glaser 為藝術家. 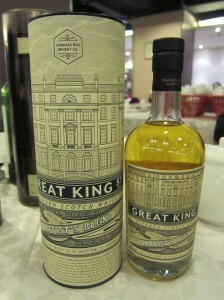 Great King Street 是 Compass Box 的重點之作, 為了這一系列還開設了一個獨立的網站. John Glaser 認為飲家近來過於重視麥芽威士忌, 忽略了過去流行了百多年的蘇格蘭威士忌主流的調合威士忌 – 調合平衡了充滿風味的麥芽原酒和纖細柔順的穀物原酒. John Glaser 以 Compass Box 發源地來命名這款調合威士忌, 希望飲家可以以新的角度去欣賞調和威士忌的美味. 我個人對所有威士忌都是一視同仁, 沒有對那一國家, 甚麼類型, 那些風格有偏好或討厭. 對一個忠實的威士忌國民來說, 喝威士忌, 是要放開懷抱, 以赤子的好奇之心, 去探索威士忌的廣大世界. 就好像人生, 是好是醜, 甜酸苦辣, 要嘗遍了, 這才算是完滿, “酒"而無憾. 來這 Great King Street, 走過人生中少少的其中一段吧. 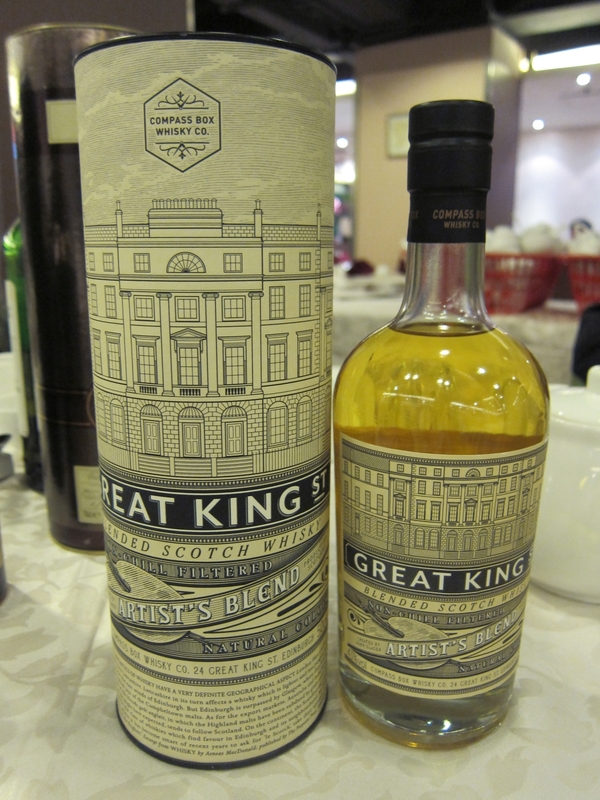 Great King Street is a blended whisky, named under the street of office of the producer Compass Box situated at New Town of Edinburgh. 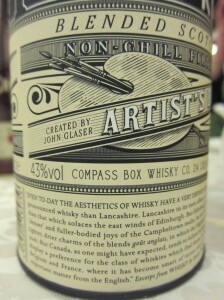 Compass Box is founded in 2000 by an American ex-pat Mr. John Glaser. The rational of the business is aimed at making Scotch whisky more approachable and relevant to people’s daily life. 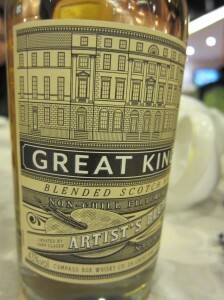 The bottlings of Compass Box are quite different from most of its counterparts. 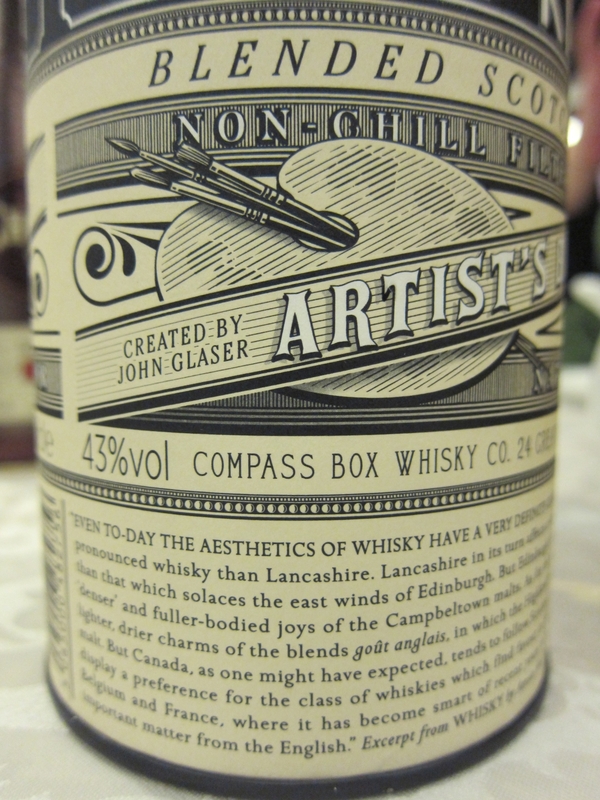 Compass Box bottlings are not classified by age or distilleries but by taste and style. Here are some examples, lighty and softy Asyla, spice Spicy Tree, peaty The Peat Monster and grain whisky Hedonism. 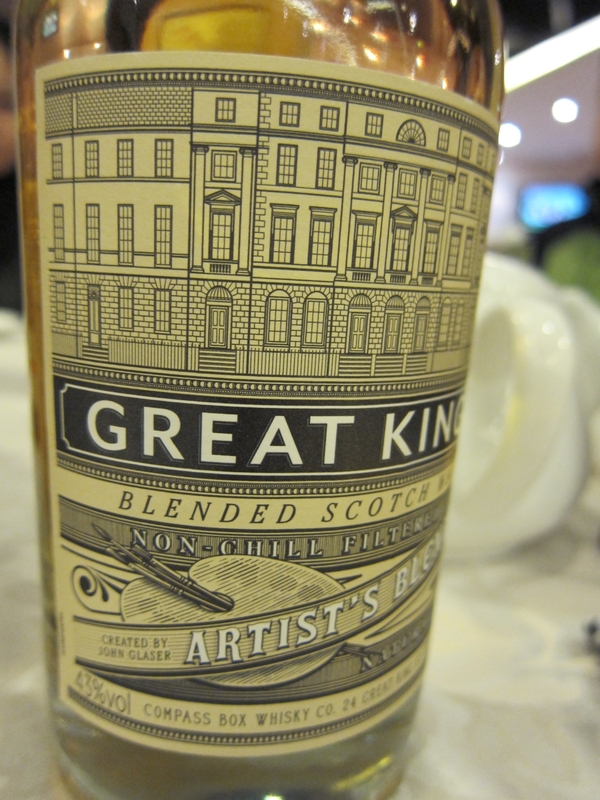 Most Compass Box bottlings are mainly blended malts, blended grain and the Scotch. John Glaser himself is called Artist by the sector’s participants. 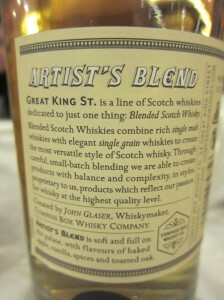 Great King Street is the spotlight of Compass Box and an individual website has been established for it. John Glaser opinioned that most connoisseurs now emphasize too much on malt whisky and overlook the blended whisk ywhich has been the mainstream of Scotch whisky over the past century – the drams well balancing by favored malts and smooth grains. John Glaser endorses this series of whisky with the origin of Compass Box and wishes that the connoisseurs can appreciate blended whisky at different angles. I have no preference on any whiskies, that no matter which country, what the type, how the style, I am pleased to try any as long as they are “whiskies". A true Whisky Nation citizen should appreciate any whiskies with an open mind, as if a child with curious heart to explore his unknown world. We have to experience good and bad, sweet and sour, all sorts of joys and sorrows, that’s life. Come to walke on the Great King Street, dust of time on path of life. Conclusion: Very sweet nosing, soft, balanced the sweetness by pepper and heab, very good. Soft and smooth body, adding bitterness of chocolate and green tea, but simpler than nose. Medium length aftertaste, a bit overly bitterness of mandarin peel and tannic, seasoned by sweet gummy. This whisky is well balancing between sweetness and bitterness, soft and smooth, very “approachable" but lack of complexity and strength, loose in structure on palate, but however the nose is excellent, good dram.